I was planning to do this Rasavangi from a long time. 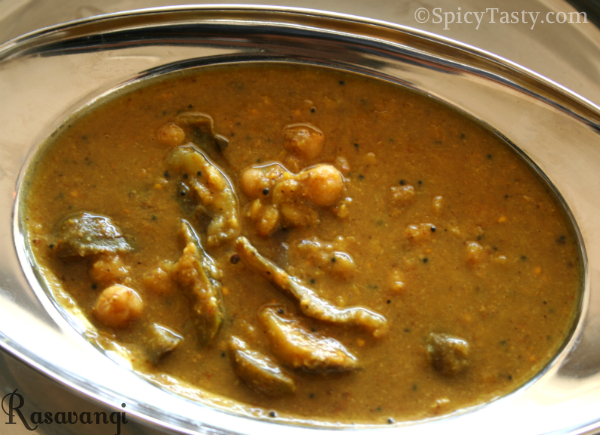 This Rasavangi is almost similar to Arachuvitta Sambar except for 1 or 2 ingredients. 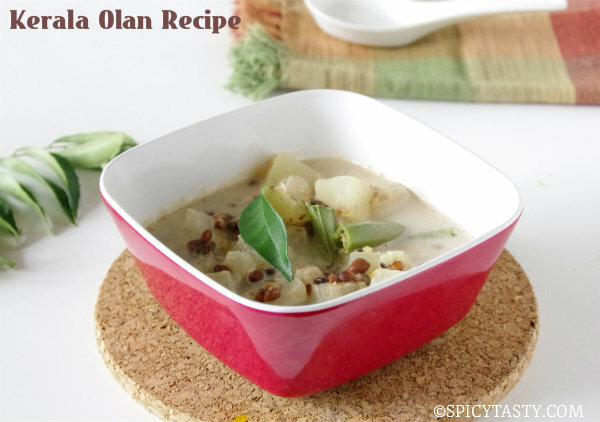 This is very simple to make and is different from usual sambar or any other Kuzhambu. In a tsp of oil, roast red chillies followed by the channa dhal, black pepper, coriander seeds and finally turn off the heat and add the coconut. Let them cool and grind to a smooth paste. In the meantime pressure cook the toor dhal and soaked chickpeas with a pinch of asafoetida and turmeric powder for 4 whistles. 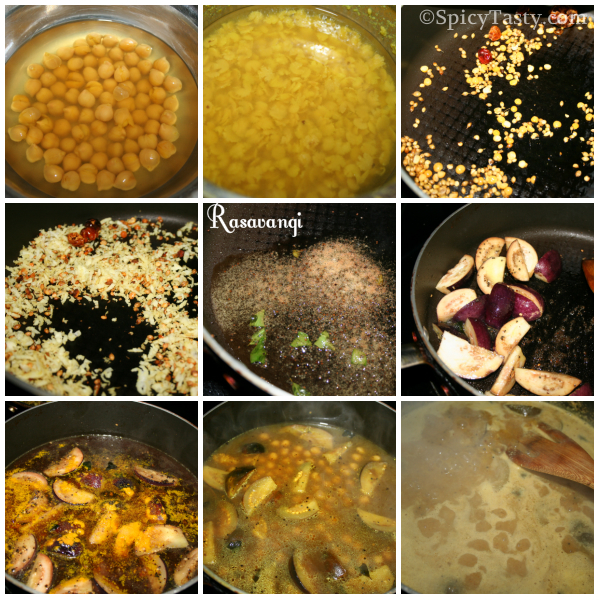 Heat oil in a vessel and add the mustard seeds, asafoetida and curry leaves. Add the cut brinjals and fry for 2 minutes. 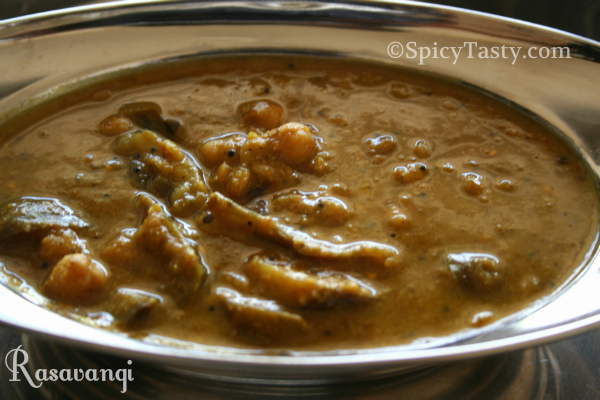 Extract water from the tamarind and to the brinjal along with the turmeric powder and little salt. Cover and cook until the brinjals get soft. Now add the cooked chickpeas, toor dhal and ground masala. Let it boil for 5 to 10 minutes. The tamarind must add the most perfect flavor addition! 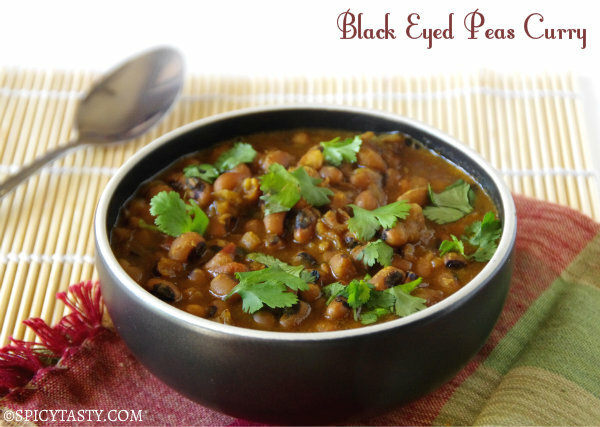 Hi arthi your dish looks really good I have a doubt should I cook the thoor dhall and chick peas together?